LS Fest West is right around the corner, and we can’t think of a better way to kick it off than with a cruise. May 2nd will mark the 3rd anniversary of the annual LSX Magazine cruise. The last few years we have had a great time as we met up at the Hoover Dam, but due to construction, security, and an earlier closing time, we were forced to switch it up a little for 2019. This year their cruise will take LS Fest West participants to Valley of Fire State Park. This public recreation and nature preservation area covers nearly 46,000 acres and is located 37 miles northeast of Las Vegas Motor Speedway. The park’s centerpiece consists of Aztec Sandstone that was formed by shifting sand dunes thousands of years ago and often appear to be on fire when reflecting sunlight. 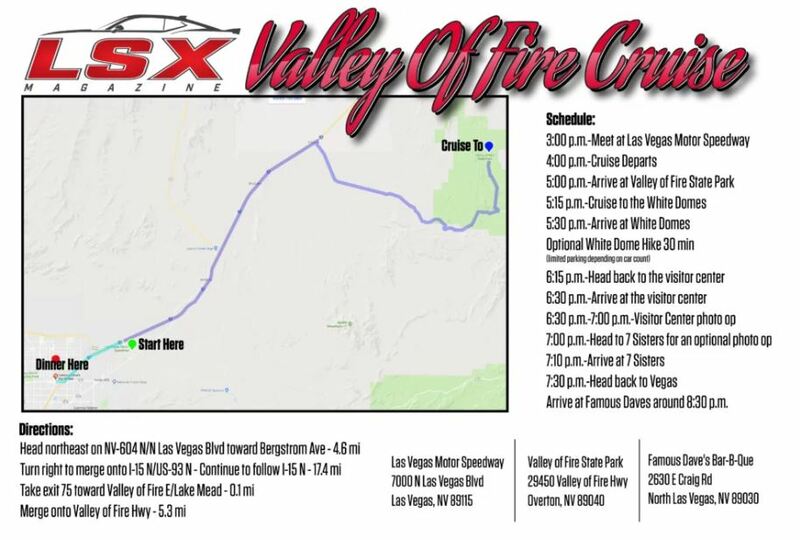 The cruise will head North on I-15 for 17 miles and then take exit 75 toward Valley of Fire E/Lake Mead for 15 miles. The trip to the Valley of Fire will take about an hour one way so plan accordingly. Water, a full tank of fuel, and a dependable vehicle are always a good idea on a trip like this. 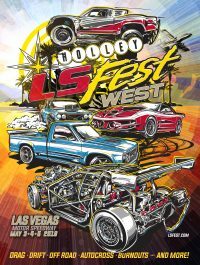 If you want to meet the LSX Magazine crew and check out some of the cars, we recommend being at Las Vegas Motor Speedway at 3:00 p.m. on May 2nd. The cruise will depart from there at 4:00 p.m. to Valley of Fire State Park. Non-residents will need to bring $10 to enter the park while residents of Nevada will be charged $8. Please bring the exact amount required as the visitor center may not be open to provide change. If you have any questions or concerns, please send us an email to bhavins@powerautomedia.com.